Please mark your calendars for tomorrow, Thursday September 13th Meet the Teacher/Parent Information Night. The evening begins at 6:30 in the parish hall. The school will be relaying some very important information in regards to the upcoming school year and parent participation. After the short gathering, parents will then proceed to their child’s class to meet the teacher. Teachers will share information for the year ahead. It is really important that you attend this evening and 1 hour of parent participation will be given to every family who attends. This is one of two mandatory nights for families so please make arrangements to attend (the other night is the AGM/Parent Support Night in January). Picture day is coming on Thursday, September 20. CHIMP is an organization that supports various charities throughout Canada. They have developed a new program for schools called a Charitable Allowance. This programs gives students $10 per month to donate to a charity of their choice under the supervision of the classroom teacher. We believe this program will in-still a sense of charity and selflessness in our students. The program is expected to start sometime in October. Letters have been sent home with your child requesting a comfort kit to be kept at the school in the event of an emergency. Please keep items to the requirements in the letter. Any items that fall outside the stated requirements will be sent back home with the child. Our Annual Fall Social is next month and we are asking you to save the date. It will be held on Saturday October 20th at our Parish Hall. Times and more details are to come. We are hoping for our largest turn out to date. It is a wonderful event for us to come together as community and celebrate the start of another school year. There will be great entertainment, food and auction items. We look forward to seeing you there. St. Bernadette School takes medical alerts very seriously. As such, we are always using best practice to stay with the recommendations, regulations and policies as set out by the BC government and our CISVA. Those whose families indicated that their child has a medical alert should have received a red coloured form last week asking for you and your physician to fill it out. It is important that we have the most current and up-to-date information. Please return the form to the school as soon as possible as we need the information to reach teachers. If you believe your child should be on a medical alert and you did not receive a red coloured form, please contact the school office immediately. 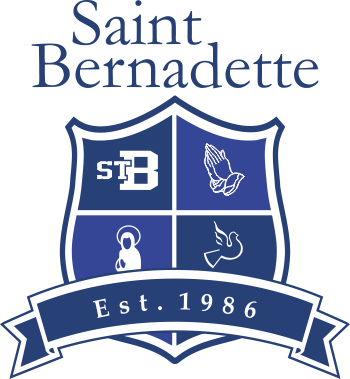 Welcome back to St. Bernadette Elementary School, we hope that your summer holidays were enjoyable. As your children start to wear their uniforms and the laundry routine is re-established we will take this opportunity to offer a special on clothing labels and share insights to help keep your uniforms looking sharp throughout the school year. If you have ever spent time searching through the lost and found bin at your school, you likely recognize the value of labelling your children’s uniforms. All orders placed online over $150.00 between September 15, 2018 to September 30, 2018 will receive one complimentary pack of 40 iron on labels and a permanent marker pen, a value of $19.00. Caring for your uniforms, tricks and tips! Please refer to washing directions found on fabric tags of every garment to best care for your uniforms. Sweaters A common misconception is to hang or flat dry the sweaters. Believe it or not, this actually compromises the yarn leaving the sweater more susceptible to damage. The trick to a long lasting and shapely sweater is to put it in the dryer at a low to medium heat. No zippers, towels or abrasive items with it. Tartan items The beauty of tartan is that it does not require daily washing. When you do wash tartan please use a liquid soap, cold water wash without anything abrasive and without towels then hang to dry. Do not place tartan items into a dryer. Ideally send the kilt or skirt to the dry cleaners periodically so that the pleats can be heat pressed to keep the garment looking smart. Zipper Ties You may or may not have noticed that zipper ties cannot be put in the washer or be dry cleaned. Zipper ties can be spot cleaned. Regular ties cannot be washed either. They are dryclean only. White garmentsWe appreciate and understand that children and white, sometimes do not mix well. Please do not use of bleach on any of our garments, this damages the fibers and may cause the fabric to tear around embroidered logos. One for wash, One for wear If you have visited our store, you have likely heard this phrase before. A school uniform is worn up to 180 days in the school year. That is a lot of wear on an article of clothing. We encourage having 2 or 3 of each daily-wear items such as pants, shirts, and sweaters to rotate throughout the week. Not only will this help the longevity of each garment, it also means less time for you doing laundry. • Shoe polish: Easy to apply and perfect for those morning when shoes need a quick polished appearance before a presentation or school photos. • Sweater stone: Helps keep the uniform garments such as sweaters and tartans fresh. Removes fibers and other particles that may appear as the garment is worn over and over. • Visit our website here to see what other little extras are available. Have more questions or feedback for us? We would love to hear from you. • Live chat with us at www.cambridgeuniforms.com – look for the “How can we help you” on the bottom right side of the website. Everyone is welcome to attend Wednesday afternoon bible study sessions. It’s a great opportunity to learn more about our Catholic faith and how we can apply it practically in our lives. We watch and discuss seminar series’ from professional theologians such as Jeff Cavins. Join us Wednesday’s 1:00-2:15pm beginning Sept. 12 in the Parish Centre, Room C. School parents – we are always out in time to pick up the kids. For more information or if you have questions, please call Brendan at 778-322-2721. Our Calendar is now updated for the 2018-2019 school year. The school exclusively uses google calendar and events are added and changed throughout the year. Please check the calendar regularly. It is best practice to add the calendar to your own google calendar so that you can see the updates as they happen (there is a + symbol at the bottom of the calendar for you to click to add). You can find our calendar under our “School Life” tab on our website. The hours are from 7am – 8:30am and 3pm – 6pm school days (Wednesdays are 2:15pm – 6pm). For the half days during the school year (excluding the 1st and last days of school), we offer the Stingers Club after school on those days. On the first day of school, Stingers Club will be open in the morning, but closed after school.